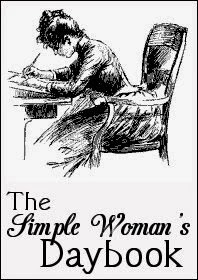 The Simple Woman's Daybook is back at it's original home, The Simple Woman's blog. REMEMBER if you are linking up you will need to change your link from the old one to the new one. Thank you! In the kitchen... I have stuff waiting for me to make spaghetti sauce, but I am just not in the mood to get up and go make it! I am creating... I just finished my C2C (corner to corner) afghan for my oldest, and i am so happy to finally have it done! It was a long, work in progress for the last year! I am going... crazy just sitting at home! I need to find a job to fill some of my time before I go completely insane! I am reading... nothing at the time, but need to go browse some books at the library to find something to fill my head! I am hoping... to hear from some places I have applied to. I am looking forward to... going to the movies with my youngest one day this week. I am learning... that I am really not cut out to just sit at home and do nothing. Around the house... I have a long "to do" list to tackle, but just don't have the energy to do any of it. I am pondering... when I am going to put up our tree. I love the Afghan, it's beautiful! Thank you for your comment and visiting my blog! I am a new follower of yours now, I also sent a FB request. Good luck on the job thing!